It seems you can't discuss the Steam Summer Sale without doing one of the following: Personifying your wallet and mourning some injury done to it; bemoaning all the unplayed games you have before piling another on it; commanding friends to buy a game, more for the price than the game and, of course, buying games. It's all a bit cliché, but give the devils their due, Steam has made the summer sale into more than an event or a quasi-holiday. It has become almost a gamer's duty. And getting to that kind of blind followership takes more than just tossing out a bunch of games at impulse-buy prices. The Psychology of Video Games examines five psychological hooks to separate you from your dough and, perhaps more importantly, keep you visiting and revisiting the Steam store to see what else is coming down the chute. The tactics: artificial scarcity; psychological reactance; "a bias towards completion"; commitmment and consistency and random reward schedules. If you haven't taken, say, a 200-level psychology course yet, you should head on over to the article and read through it, so you're a little more informed about what impulses the sale is activating in you. Of these, the "bias toward completion" seems to me to be the most insidious. 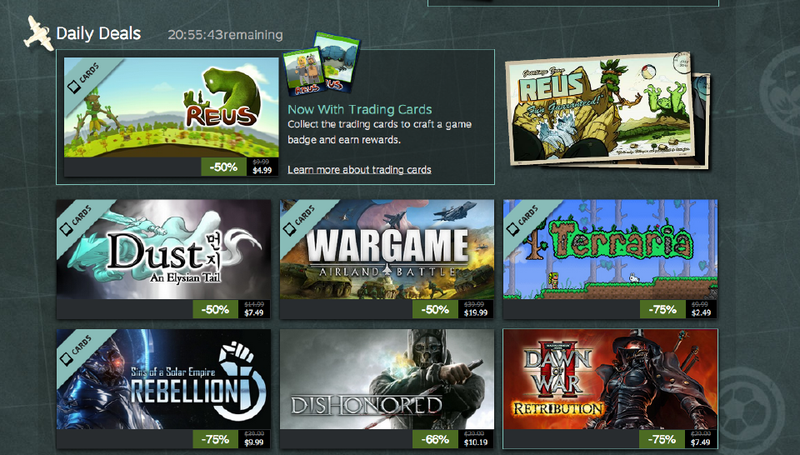 Valve has a ton of goodwill and yes, the Steam Sale is one part of it. A bunch of games sold at discount beats the alternative, a bunch of games sold at full price, after all. There still is some manipulation going on here because, frankly, that's what marketing and putting on a sale is all about. So read up on it, and if you still want Dishonored for $10.19—great (and damn, that is a fine price). But you'll be making a more affirmative choice for the purchase, instead of an excuse to do so.